You’d never guess this luscious vegan cheesecake was dairy-free! 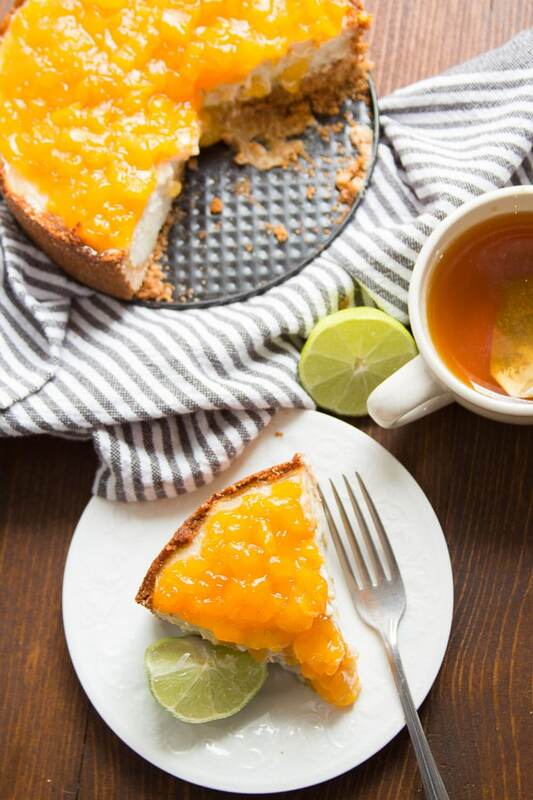 Rich, creamy, and topped with a sweet and zippy mango lime topping, this one is about to become your new favorite dessert. But now I’m asking you nicely to please put mango lime topping on it. It was so good, and a refreshing change from the usual cherry (or whatever) cheesecake. I kind of ended up with this topping by accident, because nothing I thought I wanted to put on a cheesecake was in season. Graham cracker crust is classic, so I made a vegan version. The challenge, depending on where you live, is probably finding vegan graham crackers. Look for ones that don’t contain honey. If worse comes to worse, substitute some other type of vegan cookie with a similar texture to graham crackers. Gingersnaps work great! You’ll want to turn your graham crackers to crumbs by mixing them up in the food processor. Then transfer the mixture to a bowl and mix with some coconut oil (or vegan butter) and sugar. Press it into a springform pan and bake.